The sugar factory kept one piler running for Dave Schlegel’s beets. Early harvest had ended, meaning Western Sugar would normally be shut down until regular harvest, but this Wednesday was different. 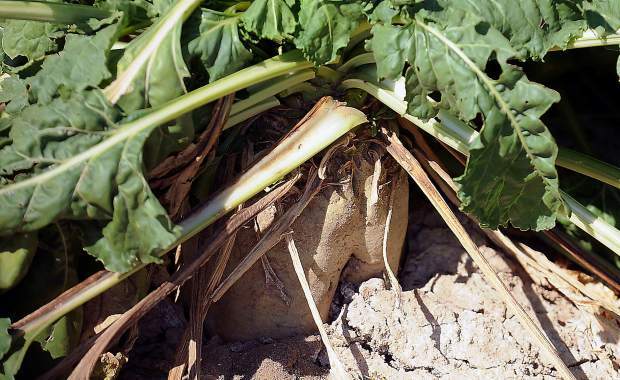 About 5 miles west of town in Mitchell Valley, Neb., just south of the former Haig School, more than two dozen friends and neighbors pulled together to harvest some 90 acres of sugar beets. Diagnosed with cancer a few years ago, Schlegel thought he had it beat. But in winter of 2012 it came back and on Aug. 29 he died at 62. A bachelor, he had few family members in the area to continue his operation after his death. But he did have a lot of friends in the farming community. “We told Dave, ‘If you get to the point you can’t do it, we’ll step up and get the job done,’” said John Dillman, a representative for Betaseed. Three crews of beet diggers, defoliators, trucks and discs started work early Wednesday and expected to be mostly finished by the end of the day. The farmers had planned to wait until the weekend, but news of bad weather on the way pushed up their schedule. The tradition of helping a sick or deceased farmer finish the harvest goes back as far as farming itself. “I’ve been with Dave on two different harvest crews when we lost a neighbor, and it’s sad to have to do it for him,” said Kendall Busch, a farmer in Mitchell Valley. One of the diggers broke down and they had to run a backup before they got it running again. When a defoliator went down, Dan Pieper from Dan’s welding in Mitchell came out and fixed it. Schlegel grew beets in the Morrill-Lyman area for many years before moving to the Mitchell Valley. Ken Schlager cooked hamburgers for the crew. They were planning on having a lunch of pork loin sandwiches on Thursday, as well, but the farmers were working too efficiently. Dillman was pulling a disc with a John Deere 4000, no cab. He pointed out that you might not find an effort like this one in a big city. There were so many people helping out in one way or another that it was hard to count, not to mention keep track of all the names. Listing them might mean someone wouldn’t be included, and that wouldn’t be right. There were the neighboring farmers who took over the irrigating this summer when Schlegel became too sick to work. The widow of another Mitchell Valley farmer who passed away a few years ago cared for Schlegel daily. Others helped out in smaller ways. Busch pointed out that beets take a lot of manpower to harvest. He said the farmers felt a sense of accomplishment with the harvest. Another group of farmers are planning to harvest Schlegel’s corn next week. Bart Schaneman is the assistant editor for the Scottsbluff, Neb., Star-Herald. See more stories from the Scottsbluff Star-Herald at http://www.starherald.com/.